The McCook Community College Lady Indians basketball team was firing on all cylinders Sunday and ran to a 112-60 win over Lamar in the Lamar Community College Classic. A trio of sophomores led the Lady Indians on the offensive end. 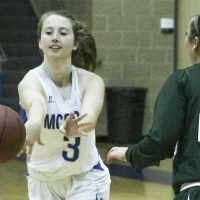 Sam Hinkle, (Rifle Colo.) led MCC with 27 points, Hailey Tiles (Rogers, Ark.) poured in 20 points and dished out eight assists and Makayla Jones, (Aurora, Colo.) scored 19 points. Freshman Tyra Cheatham (Basin, Wyo.) was also in double-figures with 15 points. Freshman Makenna Bodette (Colorado Springs) scored 11 points and snagged a team-high 11 rebounds. “Shots fell early and it propelled us in all facets of the game,” Fernetti said. The Lady Indians shot 42 percent from the field, fired in 15 shots from the 3-point line, forced 44 turnovers and came up with 21 offensive rebounds. “I’m just very proud of the team and how we played together,” Fernetti said. The 9-3 Lady Indians close out the 2018 portion of the schedule at home this weekend hosting Eastern Wyoming Friday at 5:30 p.m. and Saturday with Laramie County Community College at 2 p.m.